One of my friends posted a link to this fabulous questionnaire last week and I think that everyone should give it a try. Especially if you're not sure what party aligns with your views on the various issues. The Vote Compass compares your answers with the five main party platforms and then tells you which party you should be voting for. Strangely enough, according to the results, I should be voting for the Liberals. But that is never going to happen. I can't stand Michael Ignatieff. Seriously, if you love Canada so much that you want to be the Prime Minister, then don't leave the country for 30 years. That one fact alone has turned me completely off him. I would have thought that it would tell me I was closest aligned with the NDP, but apparently they are even more socially liberal than I am. So I guess I have some hard thinking to do before May 2. The decision will include whether I am voting for the leader of the party, or the candidate in my riding. I know that everyone complains about poor voter turn-out. Maybe we're all burnt out from having had three elections in five years. I used to be horrified that so few people voted, and then I changed my mind. I don't think you should vote if you don't know anything about anything. As a country we need the educated vote; we need the informed voter making the decisions. If you don't care enough to get the information, don't bother showing up. How do uninformed voters make their decisions? Alphabetically? Have campaigns to encourage people to vote ended with the uninformed voter standing in the booth uncertain as to what to do next? Don't just tell people to vote, encourage them to become knowledgeable about the issues and the party's positions on those issues, and then vote. If we want accurate representation in Ottawa, then we need elected officials that have informed and engaged constituents. Then, after the election, all those who didn't bother voting don't get to complain about the government either. Don't feel like your vote won't count if you are voting for a party that doesn't usually get many seats. I've heard some people say, "Why bother voting, my party isn't going to be the majority anyways." Here's why, we need a strong opposition to keep the ruling party in check. We need the checks and measures of the other parties to keep moderation in our government. I think we can all see what has happened in Alberta after having the Progressive Conservatives in power for 40 years. It's gone to their heads. As many of you know, I strongly support universal healthcare, and ask that you please consider taking the time to come out to the All Candidates Health Care Forum that the Palliser Friends of Medicare is hosting at the Medicine Hat Public Library at 7pm, April 11. You do NOT need to be a member of Friends of Medicare to attend this event (although it would be great if you became one!). 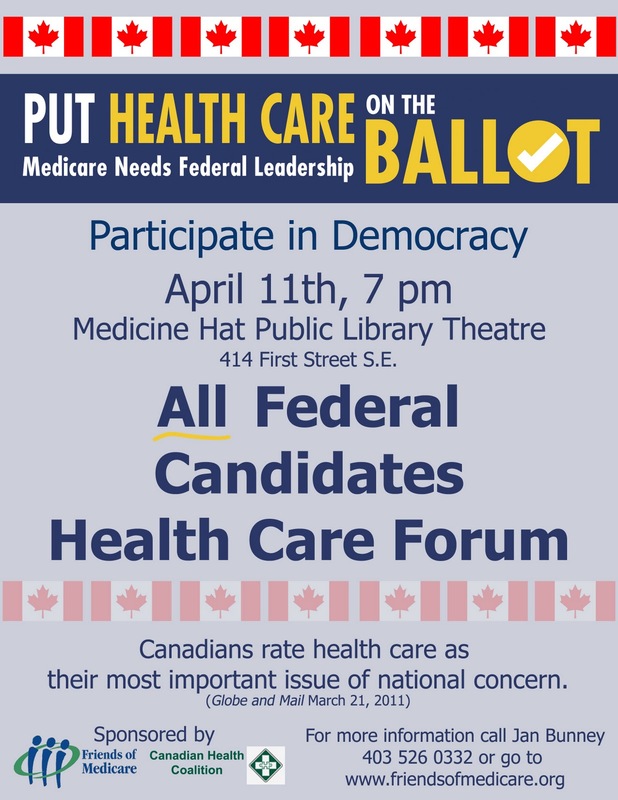 For more information on the Federal Government and healthcare, check out the Canadian Health Coalition's election primer and the Council for Canadians website. Also, if you have moved or turned 18 since the last election, you will probably need to register to vote.